Karl Robertson's parents Cathy and Anthony Robertson and his cousin Aisling Reid. A JURY HAS recommended the nationwide roll out of handheld devices to allow Gardai make road-side checks on motorists. The recommendation was made at the inquest into the death of a 28 year old jogger struck and killed in a hit and run collision by a disqualified driver. Karl Robertson (28) of Castlekevin Road, Kilmore West, Dublin 5 was the victim of a hit and run at Hazelwood Park, Artane on March 8 2017. He was discovered at the scene by a passing cyclist and died the next day in hospital. Family said “Karl was a totally innocent victim killed by a driver who had absolutely no respect for the law”. “The person who killed Karl had three separate driving bans at the time of the collision and he continued to drive ignoring each ban. 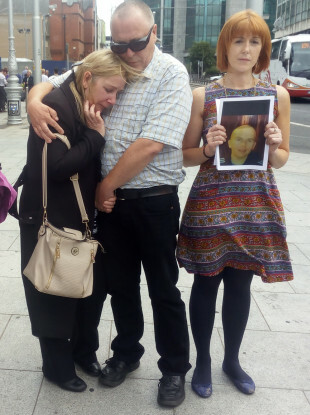 We believe that the inability of the Gardai to identify this disqualified driver, prior to the collision, lead directly to Karl’s death,” the family said in a statement after the inquest at Dublin Coroner’s Court. Described as “a loving, kind, helpful, caring, gentle soul”, family said the young man loved jogging to keep fit. “He was adored by his mother and father. He made them very proud by being the beautiful person he was…the void he left in everybody’s lives in indescribable,” cousin Aisling Reid said. Stephen Morris said he was driving up Hazelwood Park at 9.50pm when saw a shoe on the road, then a wing mirror and then a body. Paramedic Brian Morrisey was off-duty when he came upon the scene to find the man critically injured. “There was a young man who said he’d seen a white van driving at speed down Hazelwood Park and he hit Karl but did not stop,” Mr Morrisey told the court. Van driver Patrick Morgan said the collision happened so fast he had no chance to brake. He presented voluntarily at Coolock Station the day after the incident. “I panicked. I drove around the corner and set the car alight. That night it was playing on my mind. I checked social media and that made it worse, I knew him,” he said in his statement to Gardai. Morgan was sentenced to five years in prison and disqualified for ten years last May after he pleaded guilty to dangerous driving causing death. Forensic Collision Investigator Sergeant Paul Kearney said Mr Robertson was out running and may have had earphones in. “He was struck as he crossed the road, he may not have been aware of the car because of the headphones,” Sgt Kearney said. A post mortem report was carried out by Assistant State Pathologist Dr Linda Mulligan. The cause of death was multiple traumatic injuries due to a road traffic collision. The jury returned a verdict of death in accordance with the findings of the criminal trial, dangerous driving causing death. In their statement, the family called on the Minister for Justice and the Minister for Transport to extend the hand-held devices, which formed part of a pilot project in Limerick, to all members of the traffic corps. “These devices will give gardai instant access to a driver’s record when carrying out their roadside checkpoints,” the family said. The family said for three days after the post-mortem, they did not know where their loved one was. “We were informed he would be returned to us on Friday March 10 but Karl didn’t come back and nobody could tell us where his body was or when it would be released to us. It caused deep distress and unnecessary pain,” Ms Reid said. Email “Family says jogger killed in hit-and-run was 'an innocent victim of a driver with no respect for the law'”. Feedback on “Family says jogger killed in hit-and-run was 'an innocent victim of a driver with no respect for the law'”.